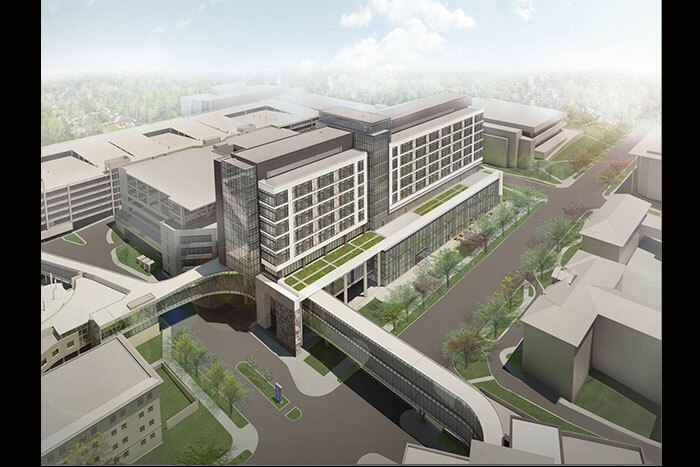 The new wing of Emory University Hospital on Clifton Road will feature 450,000 square feet on nine levels, providing 210 patient beds as well as diagnostic and treatment spaces. Rendering courtesy of SmithgroupJJR. The Library Service Center, located on Emory's Briarcliff property, will be an offsite archival facility operated jointly by the libraries of Emory and the Georgia Institute of Technology. Rendering courtesy of KSS. Featuring a classical design and modern amenities, the new science building at Oxford College will include classrooms, wet labs, faculty offices and collaborative spaces for astronomy, biology, chemistry, geology and physics. After recently completing the Atwood Chemistry Center addition and renovations to the Manuscript, Archives and Rare Book Library, Emory is continuing several major construction and renovation projects designed to provide cutting-edge facilities for teaching, learning, research and patient care. Some projects are expected to be finished as early as this fall, while others will continue into 2016 and 2017. In addition to those that are underway, “there are many projects coming up on all campuses,” says Charles Rossignol, program manager for Emory Planning Design and Construction, including a new Campus Life Center, currently in the design phase. Here’s what’s happening now on the Emory University campus in Atlanta and the Oxford College campus in Oxford, Ga. This new wing of Emory University Hospital on Clifton Road will feature 450,000 square feet on nine levels, providing 210 patient beds as well as associated diagnostic and treatment spaces. The patient care units are being designed for both cancer and transplant patient populations. The associated underground parking deck is scheduled to open in January 2017, in preparation for occupancy of the building later that year. Bridges and concourses: This month work will begin on a new section of the pedestrian walkway, which will connect Winship Cancer Institute to the Lowergate Parking Deck. To accommodate the construction process, certain temporary walkways will be created in order to efficiently support the ongoing daily operations of the Emory Clinic, while allowing the construction teams to have access to the areas where they will begin their work. These temporary walkways will be visible on the edge of the Emory Clinic driveway. In addition, the Plaza level entrance to Winship Cancer Institute will be temporarily closed during nights and weekend hours to allow the construction teams to work in that area. The new bridge is projected to open in the first quarter of 2017. Hospital expansion structure: Along Clifton Road, the concrete superstructure of the new Emory University Hospital Expansion is continuing to progress. Work is currently taking place on the sixth level, as crews work to complete the full nine-level structure by early 2016. Even while the higher levels of the concrete superstructure are being completed, work is also advancing on the exterior and interior components of the project. Hospital exterior: Construction of the exterior of the building began in July 2015 and will continue through the summer of 2016. Currently the exterior skin activities include the parapet steel on the fifth floor and exterior sheathing. Upcoming activities include installation of glass, marble, granite, stucco, roofing and many other enclosure elements. Hospital interior: To help design the best possible patient room experience, the project team has been using full-size mock-ups to gather feedback from patients, family members and staff. The full interior design is expected to be complete later this fall. Construction of the interiors of Levels 1 and 2 will begin this coming October, with the first patients being projected to use the new facility in the first quarter of 2017. Interior finish work is underway on the Library Service Center, under construction on Emory’s Briarcliff property, according to Director of Project Management Heath Miller. This work includes paint, tile, ceilings and doors. This offsite archival facility, operated jointly by the libraries of Emory and the Georgia Institute of Technology, will house a shared collection of books and other materials. The project continues on schedule for its completion in late October 2015. The project owner for this facility is a joint venture between Emory and Georgia Tech. The McTyeire Hall demolition project, which began in mid-June, is in its final stages, according to Glenn Kulasiewicz, program manager for Planning, Design and Construction. The final grading to the site and seeding for the grass have been completed and the new sidewalk crossing for the site is open. 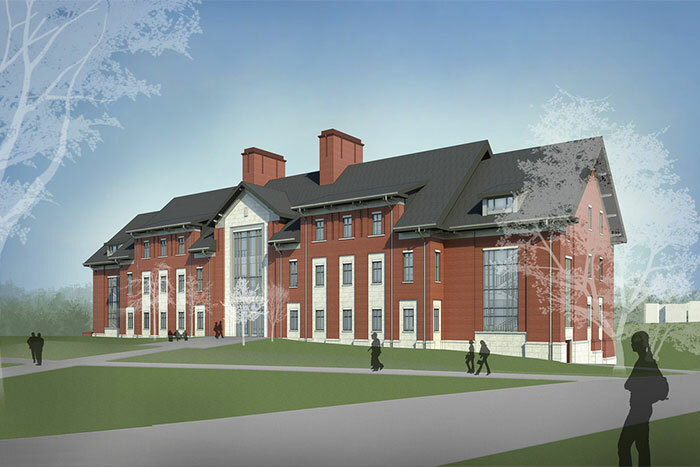 The removal of the 70-year-old residence hall is part of a project that will help provide additional space for the future renovation of the Dobbs University Center (DUC). The Michael Street and Peavine deck re-striping projects have been suspended for the start of classes until parking counts normalize. “We expect to resume work late September,” Rossignol says. 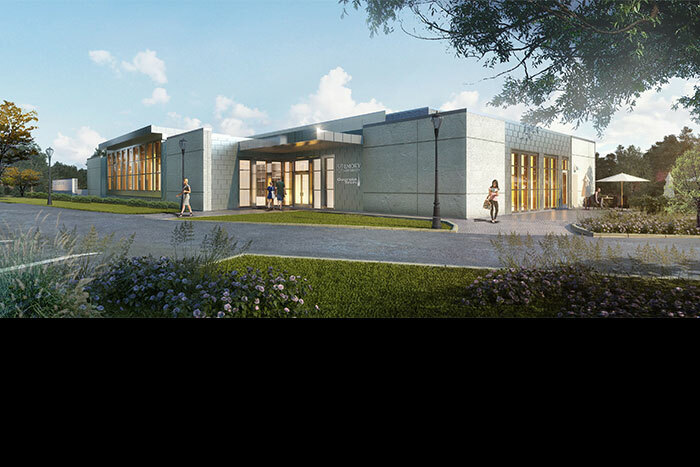 Featuring a classical design and modern amenities, the new science building at Oxford College will include classrooms, wet labs, faculty offices and collaborative spaces for astronomy, biology, chemistry, geology and physics. The exterior finishes (slate roof, granite, brick, glass) are all nearing completion, Rossignol says. Interior finishes (flooring, ceilings, paint, doors, etc.) are well underway. Lab casework, fume hoods and biological safety cabinets are being installed. Mechanical, plumbing and electrical systems are installed and commissioning has started. Outside, the greenhouse is built and excavation of the amphitheater has begun. Anticipated completion for the science building is December 2015 for spring semester 2016 classes. Hamill Street was closed to vehicular traffic over the summer and the intersection of Haygood and Hamill Streets was rebuilt with brick pavers and traffic-calming “speed humps,” along with new granite planters and walls at the entrance to Elizer Hall, says Rossignol. This fall, the rest of Hamill Street will be repaved with bricks to match Few Circle (the quad) and lined with new trees and street lights to create a pedestrian-friendly area between the Fleming and Elizer/Murdy residence halls. Get more information and updates on construction projects at Emory.